A question asked by all who hear about nuclear propulsion is how crew on a nuclear-propelled spacecraft can safely live with a powerful source of radiation. The Hiroshima cloud with all its horrific effects on people still casts a shadow on anything nuclear. particle fluxes, number of particles emitted per unit area and unit time) will reduce with 1/d2, with d being the distance from the reactor. At sufficient distance an actual shield may not be needed to protect crew and equipment of a nuclear-powered spacecraft. However, d might be impracticably large: so, a material shield is always included in designing a nuclear propulsion system and in drawing its mass budget. Radiation may be roughly divided into primary and secondary. The former is the immediate result of fission, and includes also the fission fragments (FF) themselves. The latter is the effect of radioactive decay of FF, and that of primary radiation interacting with matter or with itself. The conceptual sketch of Figure 7.9 shows how complex radiation is, so this section will only outline its basic features and its shielding. What must a well-designed shield do? In a nutshell, a shield should slow down fast neutrons enough to be captured by the shield nuclei, and absorb the energy of all gamma photons [Glasstone, 1955]. In fact, gamma-rays and neutrons are the most dangerous constituents of "radiation", because they penetrate matter farthest. A shield dimensioned for these particles can stop everything else. Nevertheless, it is instructive to see how less energetic particles, such as alpha and beta, are stopped. 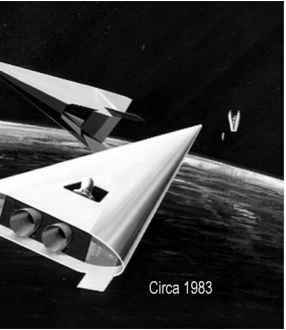 A shield needs not to be thought of as something necessarily separate from the engine: the shield surrounding nuclear reactors for space propulsion may include also the propellant and, in most conceptual designs, the propellant tanks, which are interposed between engine and crew. The reader is warned about the units (cm, gram, s) used in this section: these units are those used by nuclear physicists. They invented this field more than half a century ago, and still use them. where p is the line absorption coefficient, its dimensions the inverse of a length. Thus I(x) = I(0) exp(—^x): the flux of particles from a source decreases exponentially along the direction x. At a distance 1/^ from the origin the I has become "e" times smaller. Alphas are He nuclei, He++, a common product of radioactive decay of fission fragments. Because of their charge, alphas are readily absorbed by matter; the energy deposited during absorption ionizes materials, producing ion pairs. Penetration by alphas is quantified by their range, R, the distance from the emitting source to the point where they actually stop. Using the I(x) law, the p measured in alpha absorption is typically large. The range scales with 1/p, so in STP air is ~2.5-3.0 cm for isotope-emitted alphas with 5 MeV energy. In aluminum the range will decrease by the factor PA1/Pair ~ 1,600, and in Pb this factor is ~ 5,000. A thin aluminum sheet stops alphas effectively. Alphas emitted by 241 Am (an americium isotope present in most smoke detectors) do not pose any danger, precisely because they are stopped by air at a very short distance from ceiling or wall. 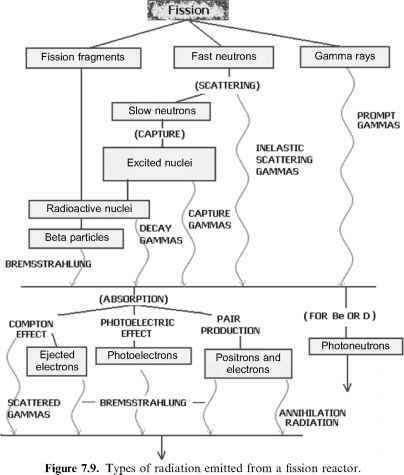 Gammas are photons of very short wavelength, 10-9 to 10-11 cm. They are typically emitted by nuclei excited by a nuclear collision or decaying. Their energies may be of order several MeV. Gammas penetrate matter in depth and shields must stop them completely, as their effect on humans is highly damaging. The line absorption of gammas follows the I(x) law above, but p turns out to be a function of I(x). Gammas of 0.1 MeV energy crossing STP air have p = 2 x 10-4cm-1 (very small, meaning longer penetration distance), decreasing exponentially to 0.4 x 10-4 at 5 MeV. The reason is again the so-called cross-section, a, a quantity defined later, that depends on the kinetic energy of the traveling particles. For lead p = 5 cm-1 at 0.25 MeV, again exponentially decreasing to 0.5 cm-1 at 5 MeV. So, the difference between air and lead when absorbing gammas is a factor of 104; see Figure 7.10. All this means that the scaling for gammas is still of the type ''density times distance''. The quantity p/p (mass/unit area), can be interpreted as the mass that must ''sit'' over a unit area to absorb the flux of gammas. Conversely, the greater p/p, the larger the distance gammas can cross before being absorbed by matter.